There is a selection of methods used in treating hypoglycemia. Techniques range from specially formulated individual hypoglycemia diet plans to prescription drugs. Watching what you eat when suffering from hypoglycemia is essential. However it is often very difficult to simply know which foods to eat and which to avoid. This website will help you determine which hypoglycemic foods you should avoid and which to eat and why. What foods should a Hypoglycemic avoid? As mentioned, the symptoms that accompany hypoglycemia are caused by a sharp rise in blood sugar after eating sugary foods or drinks, or refined carbohydrates. These foods (also known as high GI foods) are absorbed very quickly into your bloodstream, causing your pancreas to overact and produce large doses of insulin which then brings about headaches, tiredness, irritability, sensitivity to noise, insomnia and all the other symptoms you may have been experiencing. The only way to ensure that your body does not react to sugar and with a large release of insulin is to eat foods that are absorbed and broken down slowly in the bloodstream. As I mention elsewhere in this website, it is simply not possible for me to list every food that a hypoglycemic should avoid nor give a one size fits all solution to hypoglycemia. In order to fully beat your condition you need a detailed individualized diet plan. Hypoglycemia is a condition that affects people in different ways. Although the above list gives a good indication of some of the foods to be avoided some foods on this list will not affect some people, some foods I have deemed ok for a Hypoglycemic to eat will cause symptoms on others. The key is keeping a detailed food diary However if you have absolutely no idea where to start the above list is a good place. Ok now you have some idea of the foods you should avoid click here to find out which foods you should eat as a hypoglycemic to help with a low blood sugar. 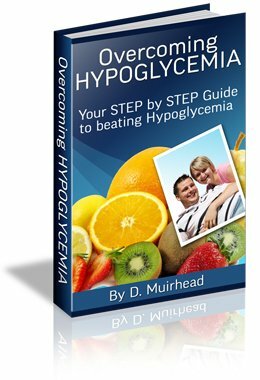 Want detailed step by step diet guides to beat your hypoglycemia? Order the Overcoming Hypoglycemia Ebook today!